Nous sommes ravis que vous ayez rejoint l'équipe MAAX! Pour vous aider sur la voie du succès, nous vous invitons à participer à notre programme de e-learning. Grâce à une série de modules, vous découvrirez nos activités, nos produits et notre culture en milieu de travail. Plus important encore, vous découvrirez ce que vous pouvez faire pour contribuer à la victoire de MAAX! Nous sommes en concurrence dans le secteur nord-américain des salles de bains, un marché de $2,2 milliards! Aujourd'hui, nous sommes un joueur majeur de l'industrie du bain et du spa. Dans ces modules, vous apprendrez qui est MAAX en tant qu'entreprise, ce que nous faisons et ce qui est important pour nous. We are delighted that you have joined the MAAX team! To get you started on the road to success, we welcome you to our e-learning program. Through a series of modules, you will learn about our business, our products, and our workplace culture. More importantly, you will discover what you can do to contribute to how MAAX wins! We compete in the North American bathroom fixtures sector, a $2.2B market! Today, we are a major player in the Bath and Spa industry. In these modules, you will learn about who MAAX is as a company, what we do, and what is important to us. MAAX puts everything we have, every consideration, into ensuring our customers and consumers not only enjoy the therapeutic and functional benefits our products provide but also the entire experience, from product selection to ordering, to delivery, to installation. By choosing MAAX, you get more than a superior bath product. MAAX's mission is to proactively fulfill the needs of the bath market by designing, producing and providing innovative bathroom products to its North American customers. • The North American leader in the residential bath products industry by offering products and service that make doing business with MAAX easier, more efficient and more enjoyable than with the competition. • Listening and learning from our customers first in order to act accordingly. • Investing in research and development in order to continuously lead by example. • Manufacturing products that offer the highest quality and exceptional value comprised of innovative style and unique features. • Launching new products that provide solutions for our customers everyday needs, specifically focusing on design, benefits, and pricing. • Offering “best-in-class” training tools, programs and services to support our customers in generating increased demand for all MAAX products. MAAX s’engage à offrir à ses clients non seulement des produits aux nombreuses propriétés thérapeutiques et fonctionnelles, mais aussi une expérience globale satisfaisante, depuis le choix du produit jusqu’à son installation, en passant par la commande et la livraison. En optant pour MAAX, vous obtenez bien plus qu’un produit de salle de bains supérieur : vous obtenez une expérience. La mission de MAAX est de répondre de façon proactive aux besoins du marché du bain en concevant, produisant et fournissant des produits de salle de bain innovants à ses clients nord-américains. • Le leader nord-américain de l'industrie des produits de bain résidentiels en offrant des produits et des services qui rendent les affaires avec MAAX plus faciles, plus efficaces et plus agréables qu'avec la concurrence. • Écouter et apprendre de nos clients d'abord afin d'agir en conséquence. • Investir dans la recherche et le développement afin de mener par l'exemple. • Fabriquer des produits qui offrent la plus haute qualité et une valeur exceptionnelle composée de style innovant et de caractéristiques uniques. • Lancement de nouveaux produits qui apportent des solutions aux besoins quotidiens de nos clients, en mettant l'accent sur la conception, les avantages et la tarification. • Offrir des outils, des programmes et des services de formation de la meilleure qualité pour soutenir nos clients dans la production d'une demande accrue pour tous les produits Maax. ① Respecter vos engagements – Soyez responsable et rendez les autres responsables. ② Ne tirez pas sur le messager – Nous prenons de meilleures décisions avec les bons renseignements. ③ Tout le monde doit contribuer – Notre entreprise est meilleure quand nous jouons tous un rôle actif. ④ Soyez direct – Répondez ouvertement et honnêtement. Dites les choses telles qu'elles sont. ⑤ Agissez de façon responsable – Profitez de chaque occasion. Ne laissez pas la bureaucratie vous empêcher de bien agir. ⑥ Soyez un agent du changement – Si quelque chose ne fonctionne pas, réparez-le. ⑦ Nous gagnons et nous perdons en équipe – Tout le monde doit ramer dans la même direction. ⑧ Amusez-vous et célébrez les succès – Si vous n'avez pas de plaisir à faire votre travail, changez votre environnement de travail ou changez de travail. Please note that it is an employee’s responsibility to be familiar and comply with the policies and procedures outlined herein. Any violation or breach of the applicable policy and procedure may result in disciplinary action up to and including termination of employment with the company. This includes an employee’s obligation to report any act or practice by another employee that contravenes the company’s policies and procedures. All employees are expected to dress in a manner that supports and maintains a professional business environment. The purpose of this policy is to create a “professional business environment” within the various MAAX locations. Employees may not dress in a manner that is offensive, distracting or disruptive to other employees, visitors or customers. All team members recognize that MAAX premises serve as a work environment to team members, visitors, suppliers and clients. Employees’ personal appearance must be consistent with MAAX’s professional image. 1. Footwear – Dress shoes and sandals are acceptable for office personnel. Casual sandals (such as “Crocs” and flip-flops) and sneakers are forbidden at all times. *** Please refer to your local health and safety policy to learn about the plant regulations concerning the appropriate foot and safety wear. 2. Slacks - Dress pants, slacks and capris are acceptable. Unacceptable attire includes sweatpants, trackpants and shorts. Jeans (denim) are acceptable for office personnel who work in the plant. 3. Shirts and sweaters – Shirts, blouses (sleeveless or not), dress sweaters and turtlenecks are acceptable. Tops that are backless or transparent, strapless tops and spaghetti strap tops are not acceptable. Tops must cover the chest, belly, sides and midriff. Sportswear tee shirts, and shirts and sweaters with inappropriate messages/graphics are not authorized. Only small, discreet logos are considered appropriate. All MAAX identified clothing is acceptable. 4. Dresses & Skirts – Dresses and dress skirts of an appropriate length are acceptable, namely those that are about two inches (5 cm) above the knee. Denim dresses (whether pale or dark coloured) and coloured denim cotton dresses whether pale or washed-out are not acceptable. 5. Hats – Wearing of hats and ball caps is not acceptable in the office. In conclusion, your attire should reflect the company’s professional image. Your choice of clothing should allow your colleagues and yourself to feel comfortable in your work environment. If you are unsure as to whether a piece of clothing is appropriate or not, avoid wearing it. All clothing should be clean, pressed and wrinkle free, not overly worn or faded and without holes or frayed areas. Keep in mind that appropriate attire is a sign of respect toward your colleagues, visitors and clients. Exceptions to the above include “Casual Friday” theme days or when an employee is involved in moving boxes or in a cleanup day or participates in a Kaizen in a plant setting. Please check with your local management to see if this applies to the location you are assigned to. Clean denim pants or dresses in good condition are acceptable during these days. “Casual Friday” does not apply when special guests are expected to attend the facility (your manager will inform you of guests arrival). Effective recruitment can involve a significant investment of time and money. 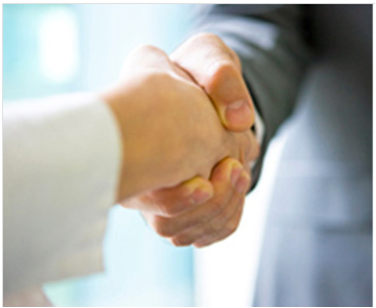 MAAX Referral Program recognizes that its employees are a key source to identify good candidates for employment at MAAX. Your own network of contacts is a valuable resource to us all. As one of our employees, you are already familiar with MAAX environment, culture, values and objectives, which you can share with potential candidates. You are therefore in a great position to identify good matches between candidates and opportunities. Our Employee Referral Program is designed to encourage you to participate in our recruitment effort and to reward you financially for successful referrals. The Employee Referral Program allows us to be forward-looking keeping our high-quality candidate pipeline full, and keeping us ready to fill position vacancies, whenever they occur. Supervisors and managers actively recruiting for positions that report directly or indirectly to them (in the same line of authority). How you can take part? We accept referrals for all vacant positions. Each referral must be for a specific position to qualify for the reward. You may not refer a candidate for future opportunities. There are no limits to the number of referrals you can make; however please bear in mind that each referral is a reflection of your judgment. A referral reward will not be paid if a candidate’s resume has already been sent to and received, by the Human Resources Department, for a specific vacant position. Rewards are paid to the employee according to these guidelines: the referral candidate must successfully complete the recruiting and screening process and must receive and accept an offer of employment from MAAX. For a plant hourly employee referral, 50% of the reward is payable three (3) months after the new employee’s hire date provided that both you and your referral are still employed by MAAX at that time – the remaining 50% of the reward is paid after six(6) months provided also that you and your referral are still employed. For contractual positions and salaried and administrative employee referrals, the reward is payable after six (6) months provided that both you and your referral are still employed by MAAX at that time. Payment of the reward is approved by your HR department and processed through payroll (see enrollment form). Applicable local, federal and state taxes will apply. This policy is intended for all MAAX permanent employees. To adopt a policy regarding the purchase of all products manufactured & distributed by MAAX Bath, for use by employees and/or immediate family members. 1. To be eligible, the employee must be a permanent employee and completed his probationary period at MAAX. 2. Employees will be able to make their selection(s) from the product catalog supplied to representatives and retailers or through the information found on the MAAX web site. The catalog will be available through their immediate supervisor. 3. All products purchased by an employee through this program must be installed in their or an immediate family member’s (i.e. spouse, parents and grandparents, children and grand-children, brothers and sisters, mother-in-law and father-in-law, brothers-in-law and sisters-in-law, daughters-in-law and sons-in-law. Adopted, half, and step members are also included in immediate family) home. Consequently the employee must sign off that the product being purchased is for use in their or an immediate family member’s residence. 4. Once the employee’s choice is made, he/she must complete the employee purchase form and submit it to his/her immediate supervisor for approval. 5. By signing the employee’s purchase order, the supervisor confirms, that to his knowledge, the product is for authorized personal usage and that the employee is eligible to participate in the program. The signed document is then forwarded to the cost accountant (CO) for a price quote. The signed document including the price of the items will be forwarded to the local Human Resources Department. 6. After all approvals are obtained, the order will then be forwarded to the Customer Care Department to be processed. *Local applicable taxes will be added on all purchases. 8. Employees are responsible for the order’s pick-up or delivery. For off-site employees, the Transportation Department will work to determine if the order can be delivered to the facility where the employee is located. Please note that all freight charges are the responsibility of the employee. 9. The amount owing must be paid in full at the time the order is placed but the cheque will only be cashed upon delivery of the product. 10. All activities related to the selection, ordering and delivery of the product must be done outside of the employee’s regular work hours and all product inquiries to the Order desk need to go through the order processing supervisor. 11. The Human Resources Department will be responsible for ensuring that all MAAX employees follow this policy. A copy of the employee’s purchase order and declaration statement will be kept in the employee’s file. 12. Slow moving or obsolete product (SLOB) purchases are not limited to the employee or an immediate family member. They may also be purchased for extended family members, friends and neighbors. There are no limits to the number of units that can be purchased with SLOB items. However, they cannot be purchased for the purpose of profiting financially from said purchases. 13. There is a maximum of two (2) bathroom renovation purchases per calendar year for manufactured products. Un processus efficace de recrutement peut impliquer un investissement important en temps et en argent. Le programme de référence de MAAX reconnaît que ses employés sont une source importante pour ce qui est d’identifier des candidats intéressants pour occuper des emplois chez MAAX. Votre réseau de contacts est une ressource précieuse pour nous tous. En tant qu’employés, vous êtes déjà familiers avec l’environnement, la culture, les valeurs et les objectifs de MAAX vous permettant ainsi d’en informer des candidats potentiels. Par conséquent, vous êtes dans une position idéale pour identifier de bons « match » entre des candidats et des opportunités d’emploi. Notre programme de référence d’employés est conçu pour vous encourager à participer dans nos efforts de recrutement et à vous récompenser financièrement pour des références réussies. Le programme de référence d’employés nous permet d’être pro-actif, d’avoir une banque de candidats bien garnie et d’être en mesure de remplir un poste dès qu’il se libère. des superviseurs et directeurs qui recrutent activement de façon à combler des postes qui relèvent d’eux directement ou indirectement (dans la même ligne d’autorité). Nous acceptons des références pour tous les postes vacants. Chaque référence doit cibler un poste spécifique de façon à se qualifier pour la récompense. Vous ne pouvez référer un candidat pour des opportunités futures. Il n’y a aucune limite quant au nombre de personnes que vous pouvez référer. Par ailleurs, veuillez considérer que chaque référence reflète votre jugement. Pour enregistrer une référence au programme, un « formulaire d’inscription » devra être dûment rempli, signé et acheminé au Département des ressources humaines accompagné du curriculum vitae du candidat. Le « formulaire d’inscription » est disponible sur le serveur M dans le dossier public RH ou dans OASIS dans les formulaires Ressources humaines. Une récompense ne sera pas versée advenant que le curriculum vitae d’un candidat ait déjà été transmis et reçu par le Département des ressources humaines pour un poste vacant donné. Les récompenses sont versées à l’employé selon les lignes directrices suivantes : le candidat référé doit compléter avec succès le processus de recrutement et de sélection, et recevoir et accepter une offre d’emploi de MAAX. Pour une référence impliquant un employé d’usine payé à l’heure, 50 % de la récompense sera versée trois (3) mois après la date d’embauche du nouvel employé pourvu que vous-même et l’employé référé soyez toujours à l’emploi de MAAX à cette date – le 50 % restant de cette récompense sera versé après six (6) mois pourvu que vous-même et l’employé référé soyez toujours employés chez MAAX. Pour une référence impliquant un poste contractuel et des employés salariés ou administratifs, la récompense sera versée après six (6) mois pourvu que vous-même et l’employé référé soyez toujours à l’emploi de MAAX à cette date. Le paiement de la récompense est approuvé par votre Département des RH et traité par la paie (voir le formulaire d’inscription). Les taxes locales, fédérales et étatiques/provinciales s’appliqueront. Cette politique s’adresse à tous les employés permanents de MAAX. Adopter une politique quant à l’achat de tous produits fabriqués et distribués par MAAX Bath à des fins d’utilisation par les employés et/ou les membres de leur famille immédiate. 1. Pour y être admissible, l’employé doit être un employé permanent de MAAX et avoir complété sa période probatoire. 2. Les employés pourront choisir le(s) produit(s) désiré(s) dans le catalogue de produits fourni aux représentants ou détaillants ou encore grâce à l’information trouvée sur le site Web de MAAX. Le catalogue sera disponible par l’entremise de leur supérieur immédiat. 3. Tous les produits achetés par un employé dans le cadre de ce programme devront être installés dans la résidence de l’employé ou celle d’un membre de sa famille immédiate (c.-à-d. le conjoint, les parents et grands-parents, les enfants et petits enfants, les frères et sœurs, le beau-père et la belle-mère, les beaux-frères et belles-sœurs, les brus et gendres. Les enfants du conjoint, les enfants adoptés, et les demi-frères et sœurs sont aussi inclus dans la famille immédiate). Par conséquent, l’employé devra signer une attestation comme quoi le produit acheté sera utilisé dans sa résidence ou celle d’un membre de sa famille immédiate. 4. Une fois que l’employé aura fait son choix, il devra remplir le bon de commande de l’employé et le soumettre pour approbation à son supérieur immédiat. 5. En signant le bon de commande de l’employé, le supérieur immédiat confirme par le fait même que le produit, à sa connaissance, est destiné à un usage personnel autorisé et que l’employé est admissible à participer au programme. Le document signé est ensuite transmis au comptable de coûts de revient (CCR) pour obtenir une soumission de prix. Le document signé incluant le prix du (des) produit(s) est ensuite transmis au Service local des ressources humaines. 6. Une fois toutes les approbations obtenues, le bon de commande est ensuite transmis au Service à la clientèle pour y être traité. *Les taxes locales applicables s’ajoutent à tous les achats. 8. Les employés sont responsables de la prise en charge ou de la livraison des produits ainsi commandés. Pour les employés travaillant à l’extérieur, le Service du transport déterminera si la commande pourra être livrée au lieu de travail de l’employé. Veuillez noter que tous les frais de transport devront être assumés par l’employé. 9. Le montant total exigible devra être réglé au moment de placer la commande mais le chèque de l’employé ne sera encaissé qu’à la livraison du produit. 10. Toutes les activités liées à la sélection, la commande et la livraison du produit devront être réalisées en dehors des heures normales de travail de l’employé et toutes les demandes de produits au Bureau des commandes devront transiter par le superviseur du traitement des commandes. 11. Le Service des ressources humaines a la responsabilité de s’assurer que tous les employés de MAAX se conforment à cette politique. Une copie du bon de commande de l’employé et de son attestation d’usage admissible sera conservée dans le dossier de l’employé. 12. Les produits à rotation lente ou désuets (PRLD) ne sont pas limités à l’usage de l’employé ou un membre de sa famille immédiate. Ils peuvent également être achetés pour des membres de la famille élargie, des amis ou des voisins. Il n’y a aucune limite quant au nombre d’unités de PRLD qui peuvent être achetées. Par ailleurs, ces achats ne peuvent servir aux fins de profiter financièrement de la présente politique. 13. Les employés sont limités à un maximum de deux (2) achats de rénovation de salle de bain par année calendrier pour les produits fabriqués. 14. MAAX a le droit de refuser un achat d’un employé si elle considère qu’un achat est abusif ou ne respecte pas l’esprit de cette politique. MAAX offers a wide range of on-trend and inspiring products to meet all of the needs of our customers. Our products are affordable and of high quality without sacrificing on aesthetics or functionality. Built for the rigors of the new construction environment. High durability and installation ease are the key features. For one-of-a-kind bathrooms that demand distinctive design. A broad range of high end with distinctive features and luxury are key features. Hassle-free products to refresh your style, your way. Quick and light demand for the average do-it-yourselfer. MAAX bathtubs come in all shapes and sizes to suit our customers' preferences, tastes, and bathroom spaces. We offer 5 different installation styles including free-standing, alcove, drop-in, corner, and wall mounted. MAAX showers can also be installed in numerous ways and are all made from a durable acrylic or gelcoat material. Each model comes pre-plumed for easy installation. Sometimes customers want a more customizable product, that's where shower solutions come in. Customers can choose their base, walls or our innovative Utile product. MAAX offers a wide array of shower doors in a variety of color options, finishes and glass. Many of our products have optional add-ons to create a spa-like experience. With our cutting-edge bath and shower systems, customers receive the benefits of a wellness coach, a massage therapist and relaxation expert in the comfort of their own home. One of MAAX's most exciting innovations, ModulR is a unique product line that includes configurable bathtubs, shower bases, and shower doors that are perfect for projects where space is limited. 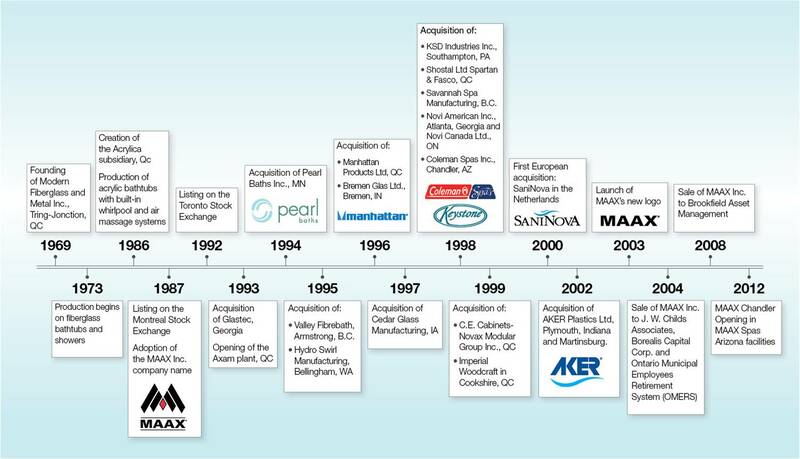 From the evolving family to the aging population, MAAX had a broad customer base with very different needs. We believe the to best serve our customer, we must always be moving forward - never complacent - finding new ways to grow their success and enjoyment. There is a long and rich history behind where we are today. MAAX has grown and changed dramatically since it first opened it's doors in 1969. Most recently, MAAX merged with American Bath Group in January 2017. The combination of Maax and ABG maintain the combined companies' balanced exposure to R&R and new construction end markets while adding geographic and customer diversity. Today, MAAX has approximately 1,200 employees working in locations across Canada and the United States. Combined With American Bath Group, we have an Industry Leading Manufacturing Network. Lachine, QC: This is our corporate headquarters, we have over 250 employees working at this location. It is where you can find one of MAAX's three research and development centers which serves as a lab and incubator of innovative ideas - here employees explore new products, technologies and trends that refine beauty, ease and enjoyment of our products! This is where you will find one of MAAX's customer care centres, shower door assembly ad manufacturing plants, and various corporate functions. Sainte-Marie & Tring, QC: This is where MAAX was first started by the Poulin family. Today over 450 employees work at these two locations. They work in manufacturing, R&D, customer service and more. The plant in Sainte-Marie specializes in acrylic and Tring produces gelcoat products. Armstrong, BC: This manufacturing plant produces gelcoat and acrylic products. Together with the Bellingham plant, they fill most of the demand in the Western part of North America. Bellingham, WA: This manufacturing plant produces acrylic products and is home to one of MAAX's customer service centers. Columbia, MD: This location is a R&D center. Valdosta, GA: This location is a gelcoat manufacturing plant. Bremen, IN: This location is a distribution center. Plymouth, IN: This location is a gelcoat manufacturing plant. Minneapolis, MN: This location is a customer service center. Martinsburg, WV: This location is a manufacturing plant and customer service center. While also making sure the company has the cash flow it needs to function, the Finance department uses MAAX's 5 Key Metrics to measure the company's success in the market. This comes down to our ability to deliver upon customer needs and desires. The IT department ensures all of the information systems needed for MAAX to function are operating properly, including SAP and the company network. This department services internal customers at MAAX. As one of the core supports for the entire organization, the Human Resources department ensures that employees have the skills, knowledge, and training necessary to successfully complete their tasks. The R&D department responds to customer feedback on improvement s to existing products and conceptualizes the products and solutions that will satisfy their unmet needs. Not only does the Marcom department control the way MAAX products are presented in order to appeal to customers, but they also ensure that product information is readily available online and in print. They also run all advertising initiatives and our public image. The Operations department is dedicated to producing products in a way that guarantees the reliability and quality that customers expect. The sales team recommend the products best suited to meeting customer's needs and solving their problems. They are the responsible for spreading awareness about our products and building our customer base. The Customer Care department interacts with customers on a daily basis, takes orders, responds to questions and works to solve after sales issues. MAAX offre une vaste gamme de produits tendance et inspirants pour répondre à tous les besoins de nos clients. Nos produits sont abordables et de haute qualité sans sacrifier sur l'esthétique ou la fonctionnalité. Construit pour les rigueurs du nouvel environnement de construction. Une grande durabilité et facilité d'installation sont les principales caractéristiques. Pour les salles de bains uniques qui exigent un design distinctif. Une vaste gamme de haut de gamme avec des caractéristiques distinctives et de luxe sont des caractéristiques clés. Des produits simples offrant la combinaison idéale de style, de qualité et de simplicité. Des produits parfaits pour vos projets de rénovation, que vous soyez un professionnel ou un bricoleur. Les baignoires MAAX viennent dans toutes les formes et tailles pour adapter aux préférences de nos clients, les goûts, et les salles de bains. Nous offrons 5 différents styles d'installation, y compris l’autoportant, en alcôve, l’encastré, en coin et mural. Les douches MAAX peuvent également être installées de nombreuses façons et sont tous fabriquées à partir d'un matériau acrylique durable ou gelcoat. Chaque installation est pré-plumé pour une installation facile. Parfois, les clients veulent un produit plus personnalisable, c'est là que les solutions de douche entrent. Les clients peuvent choisir leur base, les murs ou notre produit innovant Utile. MAAX offre une grande éventail de portes de douche dans une variété d'options de couleur, de finitions et de verre. Beaucoup de nos produits ont des modules optionnels pour créer une expérience spa. Avec nos systèmes de bain et de douche de pointe, les clients reçoivent les avantages d'un entraîneur de bien-être, d'un massothérapeute et d'un expert en relaxation dans le confort de leur propre maison. L'une des innovations les plus intéressantes de MAAX, ModulR est une ligne de produits unique qui comprend des baignoires configurables, des bases de douche et des portes de douche qui sont parfaites pour les projets où l'espace est limité. De la famille en évolution au vieillissement de la population, MAAX avait une large clientèle avec des besoins très différents. Nous croyons que pour mieux servir nos clients, nous devons toujours aller de l'avant - jamais complaisants - trouver de nouvelles façons de développer leur succès et de plaisir. Il ya une histoire longue et riche derrière où nous sommes aujourd'hui. MAAX a grandi et a changé radicalement depuis qu'il a ouvert ses portes en 1969. Lachine: C'est notre siège social, plus de 250 employés travaillent à cet endroit. C'est là que vous pouvez trouver l'un des trois centres de recherche et développement de MAAX qui sert de laboratoire et d'incubateur d'idées novatrices - ici les employés explorent de nouveaux produits, technologies et tendances qui affinent la beauté, la facilité et la jouissance de nos produits! C'est là que vous trouverez l'un des centres de service à la clientèle de MAAX, les installations de fabrication d'ensembles de portes de douche et les diverses fonctions d'entreprise. Sainte-Marie & Tring: C'est là qu'a commencé MAAX. Aujourd'hui, plus de 450 employés travaillent à ces deux endroits. Ils travaillent dans la fabrication, R & D, service à la clientèle et plus encore. L'usine de Sainte-Marie est spécialisée dans l'acrylique et Tring produit des produits gelcoat. Armstrong, C.-B. : Cette usine fabrique du gelcoat et des produits acryliques. Ensemble avec l'usine de Bellingham, ils remplissent la plupart de la demande dans la partie occidentale de l'Amérique du Nord. Bellingham, WA: Cette usine de fabrication de produits acryliques abrite l'un des centres de service à la clientèle de MAAX. Columbia, MD: Cet endroit est un centre de R & D.
Valdosta, GA: Cet emplacement est une usine de fabrication de gelcoat. Bremen, IN: Cet emplacement est un centre de distribution. Plymouth, IN: Cet emplacement est une usine de fabrication de gelcoat. Minneapolis, MN: Cet emplacement est un centre de service à la clientèle. Martinsburg: Cet emplacement est une usine de fabrication et un centre de service à la clientèle. Tout en veillant à ce que la compagnie dispose du flux de trésorerie dont elle a besoin pour fonctionner, le département des Finances utilise les 5 mesures clés de MAAX pour mesurer le succès de l'entreprise sur le marché. Cela se résume à notre capacité à répondre aux besoins et aux désirs des clients. Le département des technologies informatique veille à ce que tous les systèmes d'information nécessaires au fonctionnement de MAAX fonctionnent correctement, y compris SAP et le réseau de la compagnie. Comme l'un des principaux supports pour l'ensemble de l'organisation, le service des ressources humaines s'assure que les employés ont les compétences, les connaissances et la formation nécessaires pour mener à bien leurs tâches. Le service de R & D répond aux commentaires des clients sur les améliorations aux produits existants et conceptualise les produits et solutions qui répondent à leurs besoins non satisfaits. Non seulement le département Marcom contrôle-t-il la façon dont les produits MAAX sont présentés afin d'attirer les clients, mais ils veillent également à ce que les informations sur les produits soient disponibles en ligne et imprimées. Ils dirigent également toutes les initiatives publicitaires et notre image publique. L'équipe de vente recommande les produits les mieux adaptés pour répondre aux besoins des clients et résoudre leurs problèmes. Ils sont responsables de la sensibilisation à nos produits et de la création de notre base de clients. Le service à la clientèle interagit quotidiennement avec les clients, prend des commandes, répond aux questions et travaille à résoudre les problèmes après vente. Le département des opérations est dédié à la production de produits de manière à garantir la fiabilité et la qualité que les clients attendent.